This refreshing Mediterranean Tomato Cucumber Salad is the perfect lunch any day of the week. Make it a meal by serving it alongside your favorite grilled kabobs with a side of a hummus and toasted pita bread. To make the salad, simply combine dried mint with lemon juice, olive oil, salt and pepper. 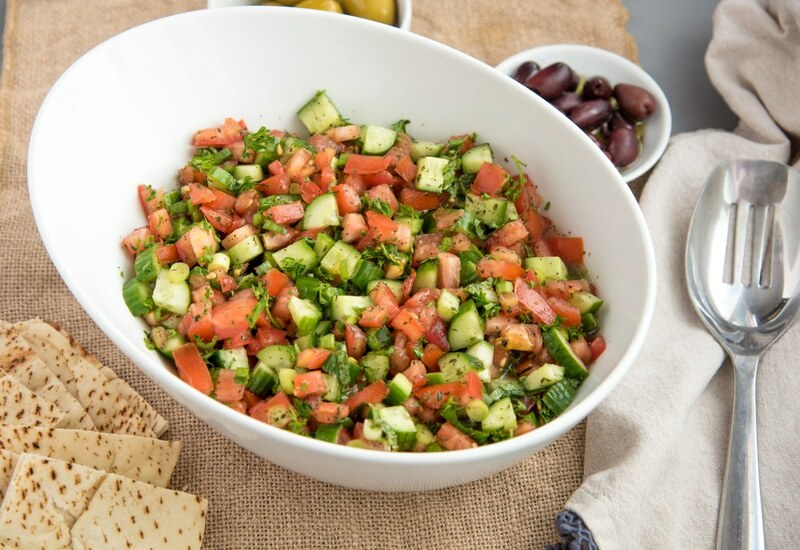 This dressing is tossed with diced persian cucumbers, tomatoes, fresh mint, fresh parsley and thinly sliced green onion. In 15 minutes you have a crisp and bright salad. Not a fan of mint? No problem! Try replacing the fresh and dried mint with fresh and dried oregano. The recipe will still have a beautiful blend of Mediterranean flavors. Per Serving: 207 calories; 14g fat; 21.4g carbohydrates; 4g protein; 0mg cholesterol; 93mg sodium. I love Mediterranean food, it's definitely my favorite cuisine to eat. This salad recipe has very authentic flavors, it's really good as a side salad and goes perfectly with my wife's Greek kabobs she grills. Great salad! The strawberries and lemon gave it a sweet and sour taste. My wife and I ate it as a starter salad, but it's really good enough to eat for lunch and as a main course dinner too. The mint and cucumber made this salad very refreshing. Excelente salad! Very light and easy to make. I used all fresh ingredients from our garden and the fresh taste is amazing. Great recipe.